The Dordogne, land of authenticity and tradition, has created, over the centuries, a rich medieval heritage which is to be found back in the beautiful white and yellow building stones of its charming villages. The Dordogne is also one of the departments of France which counts not less than 10 classified sites, the largest number of destinations labeled "most beautiful villages in France". Villages, soaked in history, invite you to wander its cobbled streets and appraise all their hidden treasures. If Beynac-et-Cazenac, La Roque-Gageac and Castelnaud-la-Chapelle are among the best known, your camping holiday in the Dordogne is the opportunity to discover more villages, certainly less famous, but equally worth a visit. During your trips on the scenic tourist routes of the Dordogne, small towns perched high up, like Domme, Belvès or Limeuil, appear around the bends. Others nest on the green banks of our rivers like Saint-Jean-de-Côle or Saint-Léon-sur-Vézère. 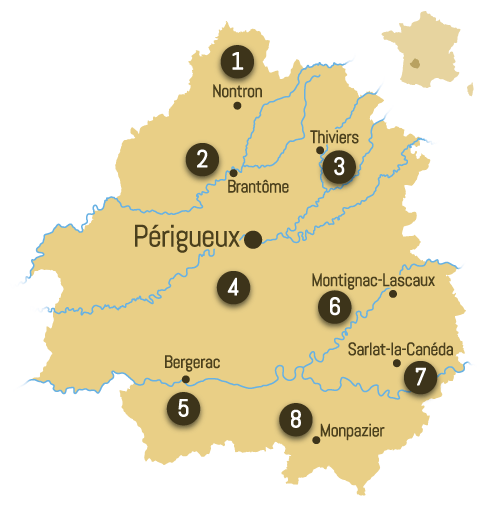 In these classified villages, many of the historic buildings have become the unmistakable landmarks of any stay in Périgord region. Among these spectacular constructions, the abbey of Saint-Amand-de-Coly, the most beautiful fortified church of the Périgord, or the former market hall of the fortified, bastide town of Monpazier, need a contemplating visit. Numerous campsites welcome you to the gates of these villages and often allow you an easy walk or trip on the bike into the town center.